This article explains how to create filegroups and move indexes into a different file group, and how to backup a database without indexes with the purpose to reduce the amount of data required to perform backups thus reducing backup time and space required. 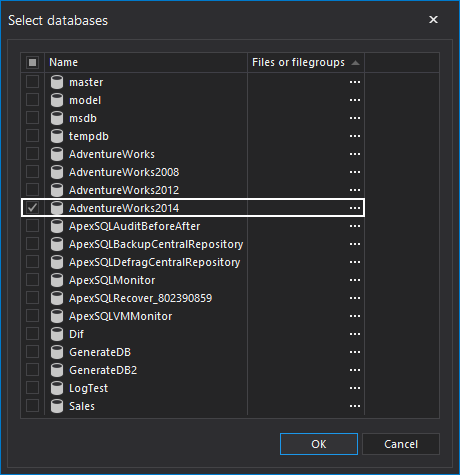 We will also show how to use the ApexSQL Backup solution for filegroups backup as a first part of the series in which we will show how to backup and restore a database without indexes, and to recreate the indexes after a restore. DBCC CHECKDB checks the logical and physical integrity of all the objects in a database and provides information of any corruption. As performing DBCC CHECKDB is a resource exhaustive task it is recommended to run it on a production server when there is as less traffic as possible, or even better, as one of the ways to speed up the DBCC CHECKDB process, is to transfer the work to a different server by automating a process and run CHECKDB after a database restore. As a backup process is a copy of a database and a restored database will be exactly the same as an online database therefore if there were any inconsistencies or issues they will be in the backup, and found in a restore. By using this approach both restores will be tested and backups verified without any impact on a production database. SQL Server stores a complete history of all SQL backup and restore operations, and other historical activities such as activities like Database Mail, Jobs, Log Shipping, Policies, Maintenance Plans, etc. on a server instance in the msdb database. In the previous article we described native SQL Server capabilities for troubleshooting SQL Server performance issues using wait statistics and especially the query wait statistic. In this part, we’ll focus on a 3rd party solution – ApexSQL Monitor. ApexSQL Monitor is a SQL Server and system performance monitoring tool designed for monitoring of operating system, SQL Server, and database performance metrics in real time including wait statistics as well as query wait statistic on cumulative and individual query level. Besides being able to track wait statistics, ApexSQL Monitor allows a database administrator to configure and receive alert notifications about wait statistics as well. The ability to successfully solve a problem and pinpoint the root cause of an issue that affects SQL Server performance depends on knowledge of the particular SQL Server system and environment, but also on personal experience which can help in determining where to start SQL Server performance troubleshooting. A regular expression (abbreviated regex or regexp and sometimes called a rational expression) is a sequence of characters that forms a search pattern, mainly for use in pattern-matching and "search-and-replace" functions. They can be also used as a data generator, following the concept of reversed regular expressions, and provide randomized test data for use in test databases. One of the most common ways to ensure that the recovery will be possible if a data-file corruption or any other disaster occurs is to create a recovery plans for this scenario. The most popular recovery plans include regular creation of database backups which can later be used to restore a database to a nearest available point in time, prior to disaster. In many cases, the primary requirement that must be fulfilled is that auditing must be performed with zero auditing data lost. Many development teams have the need for a quick and easy but effective solution to committing SQL Server database objects to source control, but aren’t yet ready to move to full source control integration at check in/check out level. In order to get objects under a source control in a “Poor man’s” approach, creation scripts need to be produced for each table, stored procedure, and any other object in a database. Afterwards, the scripts need to be committed to a source control system. 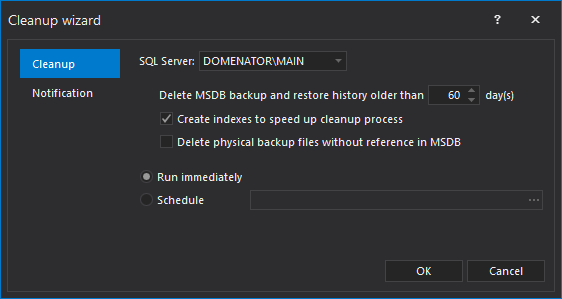 When recovering from a SQL Server database failure, a database administrator needs to restore a set of SQL Server database backups in a logically correct and meaningful restore sequence. With this in mind, to the goal is to devise a disaster recovery strategy by creating a solid backup plan, as well as a proper database restore plan in SQL Server. 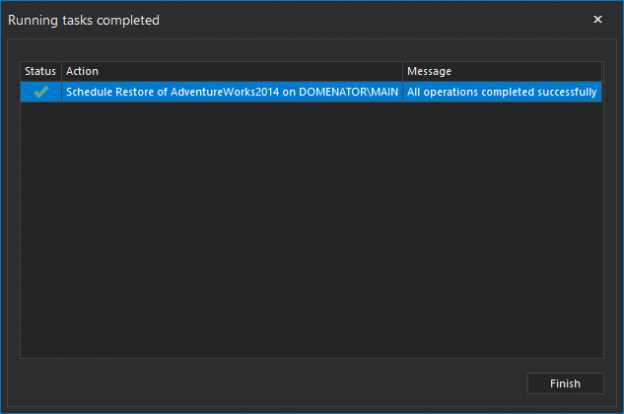 This article will describe 2 different solutions for creating and scheduling a database restore in SQL Server. To prevent accidental data loss, it is always good to ensure that there is a disaster recovery solution available. This can be easily achieved by having a standby copy of a primary database on another SQL Server instance, which can be achieved via log shipping. A SQL Server database can have stored procedures, tables, defaults, views etc. that aren’t being used anymore, and unless you determine which of your objects are truly unreferenced you will be stuck with them, or risk breaking your database if you delete a wrong object. This is where ApexSQL Clean can help. ApexSQL Clean’s main features are already described in SQL code analysis – full body scan of a SQL database, but here we would like to point out and present one more useful feature: creating a sql database cleanup report. In order to have a complete database cleanup report and dependencies analysis procedure, ApexSQL Clean has a reporting mechanism, which allows keeping track of selected objects and their dependencies. Whenever building a SQL Server database, it must determine which objects to include in it. ApexSQL Build provides a detailed object analysis for building a database or for a database update deployment, with an ability to customize the SQL database objects and include dependent objects automatically. Selecting objects is easy and allows to easily customize SQL database objects.